This Calundula flower reminded me of a ballet dancer's tutu. A peek over the wall a the Camelback and Central light rial station looking at the Landmark Towers. The tower is now a condominium building, but just a few years ago it was a luxury apartment tower. When I first moved to Phoenix, there were a few well known movie people who had apartments in this building. Taken from the east side of Phoenix and filtered through the haze and pollution of a big city. I've watched this playground being constructed near my house and have decided that is is the most cheerful playgound I've ever seen. Last week I learned that this playground belongs to a new facility being completed called Ryan House. Their mission is to provide respite, care, and support for children with life-threatening conditions and thier families. A lofty goal. I'm sure this playground will brighten the day of many children. The half-time show at last Friday night's basketball game featured cheer-leading squads from all over the state of Arizona. That is a lot of cheerleaders in one space. I'm not sure how this large group were able to synchronize their routine, but they were all well in step with each other. I went to a Phoenix Sun's Basketball game last Friday night with my friend Janet and we were greeted by these boisterous drummers as we entered the arena. 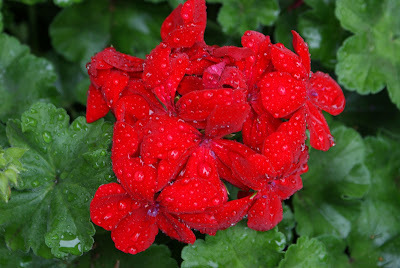 Someone left the geraniums out in the rain! Yesterday was one of those rare rainy days in Phoenix. Clouds hovered overhead all day long. 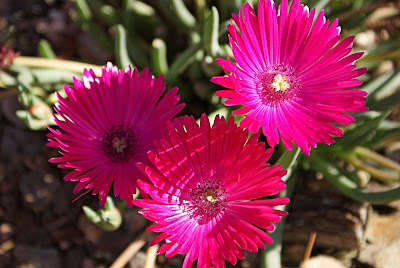 I spotted these brilliant blooms on an ice plant. Their bright color is hard to miss. 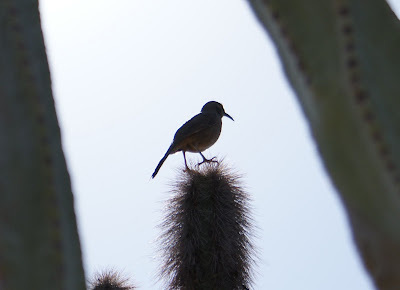 If you are going to perch on top of a prickly cactus, you had better step lightly. This bird seems to have the knack. The Gateway Center is an office building located in east Phoenix very near the airport. I like the fountain that is located in front of the building, but I especially like all those flowering pear trees that surround the fountain. They are all in bloom right now and they look wonderful. These beautiful trees are blooming all over the city right now. There are even a few on the grounds of the office complex I work in. Here is the full view of the "Options" sculpture that I featured yesterday. As you can tell from yesterday's photo, I like playing with the lines on this one. There are a total of 18 Allan Houser sculptures on display at the Desert Botanical Gardens and including today's photo, I've shown you 12 of them. This one is called "Options" and it is from Houser's abstract collection. Tomorrow I'll show you another view of this piece. One of the reasons that I love the Desert Botanical Garden so much is that you never know what you might see on any given visit. On Saturday I was treated to a rare sight indeed. This tiny little hummingbird sitting on its nest. 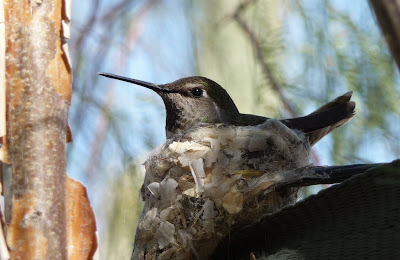 One of the garden volunteers saw me carefully taking photos and told me that this was a Anna's Hummingbird and that there are two eggs in the nest and they are the size of small jelly beans. I feel so privileged to have seen such a remarkable sight. A heart shaped prickly pear cactus seemed like the perfect Valentine greeting from sunny Phoenix Arizona! Wishing you all a full heart on this day. This big tall cardon cactus makes an excellent home for the birds. With its many arms, there is room for everyone. If you are standing in the lobby of the Phoenix Art Museum looking toward the entrance, this is your view. The large lighted sculpture hangs in the lobby giving it a warm glow, especially in the evening. One of these days, I'll get over there and take a photo of it at night. Out the window you can see some of the buildings along Central Avenue and the power lines that power the light rail. 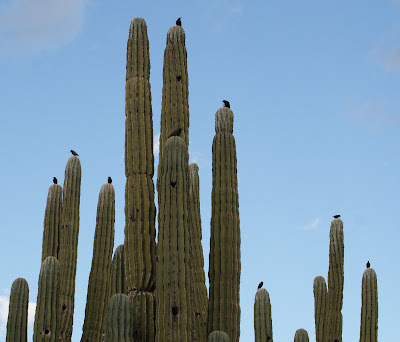 Birds like to eat the fruit that grows on the top of some cactus, but they have to be very careful of the thorns that are longer than they are wide. I've watched them and they make it look easy. For the past 20 years, there has been an annual art exhibit in North Scottsdale called The Celebration of Fine Art. It is located in a huge white tent arranged in a "U" shape and it runs from January through March. It features 30 to 40 artists from all over the nation who spend the three months creating and selling their art. It is a unique opportunity for art lover's like me, to talk to the artists and learn what inspires them and how they create thier unique beauty. I try to go every year and have purchased some pieces that I hold very dear. 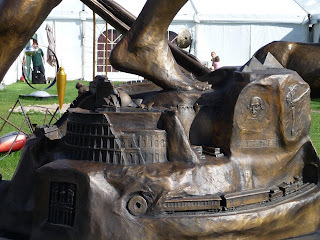 This year I met Victor Issa, the sculptor who created the piece picture above titled "The Power of Thought". In his description of this piece he says "All human accomplishments throughout the centuries began with a single thought". The base of the statue features depictions of man's accomplishments including the Roman Coliseum, the Taj Mahal, the Great Wall of China, the Pyramids, and works by Shakespeare and Beethoven among many more. The figure of the man is holding on to an unraveling line of DNA that turns into tracks for a bullet train that is preceded by a steam train which is preceded by the wheel. In his other hand we see him releasing a Super Sonic Transport. There is so much to see here that I had a hard time pulling myself away. I am hoping that Mr. Issa is able to sell this piece to some organization in this area who will put it on permanent display so that I can enjoy it from now on. Sunday night I had dinner with two great friends, one of whom was visiting from Denver. We went to Barrio Cafe, a wonderful place to get authentic southern Mexican cuisine in a warm and friendly atmosphere. Two hour waits for tables is not unusual at this very popular establishment, but we were lucky. In spite of the crowded dining room, we got a table right away. 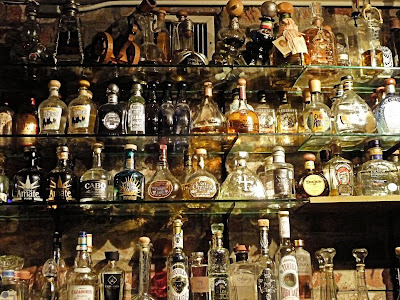 In addition to the fabulous food, the restaurant also boasts the largest assortment of tequila in the Phoenix area. The photo above only shows a few of the bottles. The shelves actually wrap around to another wall. Check out their web site. You might even find some photos of some of the delicious choices we made like enchiladas mole and churros and flan for dessert. Great company and fantastic food, what could be better? This memorial Statue is located near the State Capitol in Wesley Bolin Plaza. It pays tribute to peace officers in all lines of service and from all over the state who have died in the line of duty. On the ceiling of a local taco joint! I'm not sure what kind of bird this is. I spotted it at the Desert Botanical Garden. I'm not sure what it says, but I like this greeting at the entrance of a home. Last week I attended a dinner meeting at the Valley Ho, a resort hotel in downtown Scottsdale. I noticed these light fixtures on the ceiling of the dining room and couldn't help thinking they reminded me a reels of film. Is it just me, or does anyone else see a resemblance? 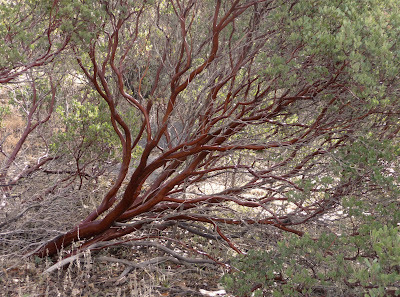 Manzanita is a plant native to the Western half of North America extending from Canada all the way to northern Mexico. 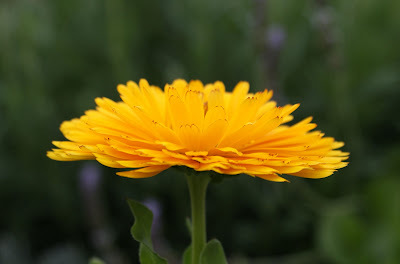 There are 106 species of the plant with the majority growing in California. It is an evergreen plant with a distinctive smooth, red bark. Some species grow into trees, but those in Arizona are usually in the shrub category. I found this one in the mountains just north of Phoenix. 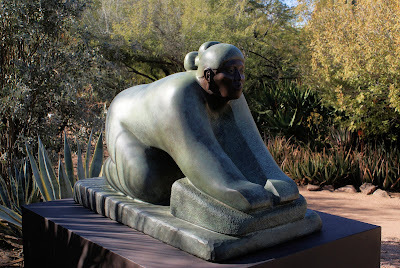 This is another Allan Houser sculpture that is on display at the Desert Botanical Gardens. This one is called "Corngrinder". 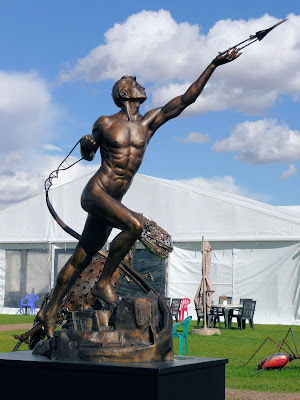 I am particularly fond of the sculpture. This table has been in my family a very long time. I am told that it was hand made by my great-great-grandfather and it has been passed down from generation to generation. It now resides in my dining room. Sometimes I look at it and try to imagine all the places its been and the changes that have taken place around it. After all, it has lived from the days of oil lamps and Victrolas to the present days of cell phones and iPods.